The hugely successful Kapil to Kohli India Exhibition concludes April 10, followed on April 12 by the much anticipated Triumphs & Trophies exhibition – Great cricket stories and their trophies. 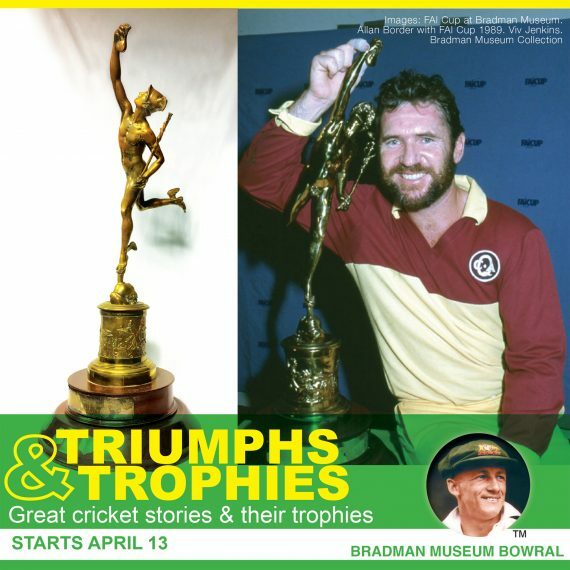 The Bradman Museum is proud to display the Warne-Muralitharan Trophy, which features the sculpted hands of the two highest wickets-takers in Test Cricket. Also displayed will be the Women’s Rose Bowl, recently won by Australia against New Zealand, The ICC Women’s T20 World Cups from 2010 & 2012 and the ICC Men’s 2015 World Cup, won by Australia at the MCG. The exhibition will also show the exquisite 1898 Final Ashes Test Match Trophy, featuring the slayed lion & victorious kangaroo. It commemorates Australia’s victory in the final test match at the SCG between Australia & England. We have a selection of precious medallions and artefacts since the 19th century, including a recently restored silver tea pot presented to Alex Bannerman for the highest score in match between Australian XI Vs a Victorian 15 in December 1880.